Today our school’s “Conference on Education” kicked off with a keynote address by Dr.R. Murali Krishna. (@DrRMKrishna) Dr. Krishna is the author of “Vibrant: To Heal and Be Whole – From India to Oklahoma City.” His keynote today focused on mindfulness and ways to use deep breathing and meditation to increase resiliency and overall health as well as happiness. I created a sketchnote during his session, and added it to my growing Flickr album of sketchnotes. As you look a this sketchnote, keep in mind the primary goal of sketchnotes (in my interpretation) is NOT to create compelling art or impress others with artistic skills. (In my case, the opposite would likely be true.) The main goal of sketchnoting is creating a visual translation of the key ideas in a presentation, so the creator of the sketchnotes can later “retell” and share them with others. So if this doesn’t make a lot of sense to you, that’s OK! While sketchnoting can be helpful to “make the thinking of a group visible” (see Rachel Smith’s TEDx talk, “Drawing in Class” for more on this) it’s primarily a personal tool to assist in encoding/recording ideas in the brain and triggering memories later. I created this sketchnote on my iPad using the Procreate app and an Adonit Jot Pro stylus. In addition to exporting the final sketchnote image, I also exported my drawing as a video which I saved to my iPad Photo Roll. I imported that video into iMovie for iPad. I slowed the playback speed to 1/4th normal speed, so the total time is about 2 minutes instead of just 30 seconds. Then I added audio narration, exported the final video at 720p, and uploaded to YouTube using YouTube Capture. I really enjoyed this presentation by Dr. Krishna and am going to work on applying some of the mindfulness strategies he taught us in upcoming days and weeks. 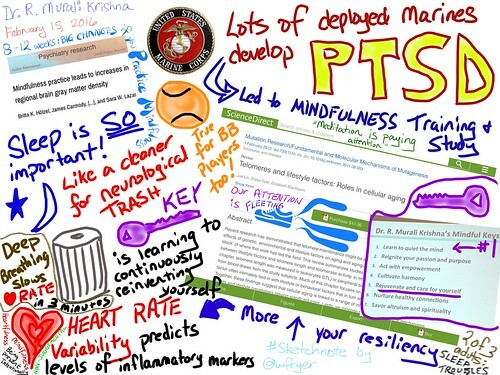 More resources about and examples of sketchnotes are available in the “Visual Notetaking” page of ShowWithMedia.com.